Potty training a new puppy can be difficult if you don't know what to do, but there are several aids you can use to help your puppy go potty where you want it to go. Using potty pads (also called puppy pads, or pee pads) is one way to help teach your puppy where it is appropriate to use the bathroom. Consistency is key to this training technique, which you can then use to also teach your puppy to eventually potty outside. The idea behind using a potty pad is to provide a visible, consistent area for your puppy to go potty. You'll want to choose something that is absorbent, easy to clean up, and large enough for the messes that your specific puppy makes. Large breed dogs may need heavy duty options compared to toy breeds. Newspapers, paper towels, cloth towels, and store bought pee pads or indoor/outdoor carpet potty stations are all options. Newspaper and paper towels can be messy and difficult to clean up after your puppy potties on them, but they are inexpensive. Cloth towels are absorbent but will need to be washed regularly, and your puppy is more likely to try to chew on it like a blanket or toy. Store bought pee pads are the most popular option due to their absorbency, size options, and ease-of-disposal. If you plan to train your small dog to use the potty indoors, then indoor/outdoor carpet potty stations specifically designed for dogs are good options. Allow your puppy to see and sniff the potty pads you chose. This will help it get used to the new item so it isn't scared of it at potty time. Let your puppy walk on the pad while you repeat a consistent command that you plan to say at potty time, such as "go potty." Puppies usually potty after sleeping, eating, drinking, and after playing. After your puppy does one of these things, you'll want to pick it up about 15 minutes later and place it onto the potty pad in anticipation of it having to urinate or defecate. If your puppy starts sniffing around on the ground instead of playing or chewing on a toy, this is a good indication that it needs to go potty. You'll want to pick it up and place it on the potty pad if it starts doing this. Your puppy may have to go potty every two to three hours. Get in the habit of taking your puppy to the potty pad every few hours. Praise and treats work wonders with puppies. If your puppy goes potty on its potty pad, make sure you immediately praise it. This can be verbal in an excited tone of voice, by petting your puppy, or by giving it a special, soft treat reserved only for potty time. Keep your puppy on a regular schedule. 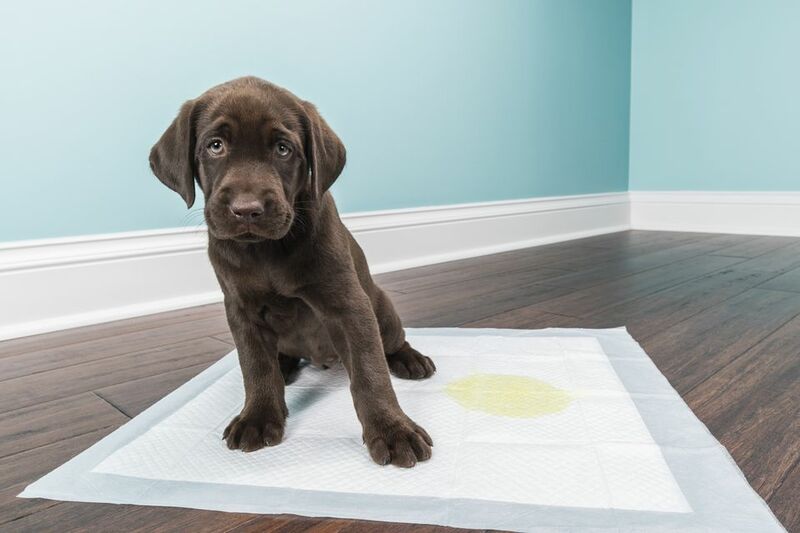 This will make it easier for you to anticipate when your puppy may need to potty. Say the same command phrase each time. Keep the potty pad in the same place until your puppy starts going to the potty pad by itself. Once your puppy knows what to do on the potty pad, you can slowly move it closer to the door or outside where you want your puppy to eventually use the bathroom without the use of the potty pad. Do not encourage your puppy to pull or chew on the potty pad, eat food on it, or play on it. This may confuse your puppy as to what the purpose of the potty pad is. Do not move the potty pad around until your puppy knows what it is for and is going potty on it consistently. Be sure to find and use a treat that your puppy is really excited about getting. This will help with the training process. If your puppy isn't making it to the potty pad on time, try putting it closer to where it usually plays or eats, and then slowly move it closer to the door if you aim to eventually teach it to potty outside. Add a bell to its collar to help you hear where it is. Leave the leash on for the puppy to drag behind it, which will leave somewhat of a trail for you to follow. Consider putting your puppy in a crate or exercise pen to nap, which may encourage it to whine if it has to potty, since dogs don't like to mess where they also sleep. If your puppy seems to be constantly urinating, talk to your veterinarian about potential problems that some puppies are known for having.